The Juniata River Valley represents Mifflin and Juniata Counties in Central Pennsylvania. Predominantly rural in nature, the region boasts fertile farm fields, the wide and clear Juniata River, and mountains and ridges covered in lush forests. Commerce and industry are focused around the county seats, Lewistown and Mifflintown, but also find roots in smaller towns like Burnham, Milroy and Thompsontown. The Juniata River Valley Chamber of Commerce provide the link for businesses to network. We work closely with the Chamber but are our own independent agency. Visitors can discover the soul of the Juniata River Valley in its surrounding nature. The Juniata River Valley Visitors Bureau can help travelers discover the Juniata River, Kish Creek and other streams that offer fishing, kayaking, canoeing and other water sports. Hiking, hunting and golfing are just a few more of the outdoor activities available to everyone. 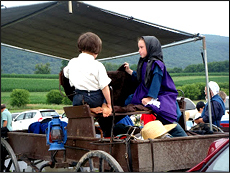 Opportunities to connect with the Amish culture abound in The Kishacoquillas Valley, also known as Big Valley. Wednesdays are Sale Days at the Belleville Livestock Auction and the whole valley comes alive with flea markets, yard sales, and produce stands. 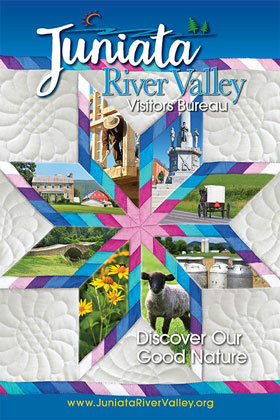 The Juniata River Valley Visitors Bureau has more information available by clicking the link on the right. Come and “Discover Our Good Nature” in the Juniata River Valley. Up for an adventure but you don’t know where to start? Check out our list of special interest tours. From antiques to road trips, bird watching to wineries, there are more possibilities to help you fill a weekend than you think! Find the list HERE. And if you need some help deciding what to do, give us a call or drop us an email. We love our hometowns and are happy to share them with you!